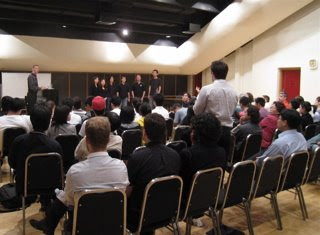 Our first event in Hong Kong was a walk across the street to the Hong Kong Cultural Centre for an a cappella workshop which the presenter had organized. It was good to be by the sea and to see the sky and have more air to breathe and sing with. 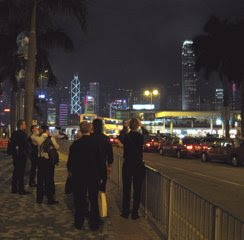 We had come from Shenzen - a short bus ride away which involves going through two checkpoints bag and baggage, one to leave China, the other to enter Hong Kong. We left China with no incident and amazingly quickly given the hordes of busses and people passing through the checkpoint. Sorry - but you don't defy signs saying No Photography... The Hong Kong checkpoint seemed to be very concerned with swine flu and there was a health form to fill out. Then, half of us went through and back to the bus, but the rest of us were collected and turned around and led into one of those small rooms in the back which one has heard about...then the rest were found and brought back. As it turned out, they had been alerted the day before to our passage through the checkpoint and wanted to check on our employment visa. Perhaps not everybody got the message, letting the first half go through without question, but with the wrong stamp in their passports. It all took about half an hour to sort out, they were very nice, and we were on our way. a series of exercises with us. 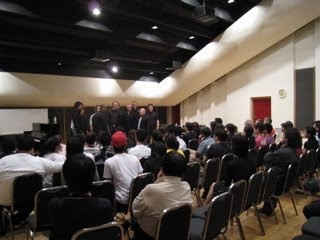 The first group up were the Hong Kong Melody Makers who had two different formations, and sang "When you wish upon a star" and Louis Armstrong's "What a wonderful world" in very jazzy arrangements. 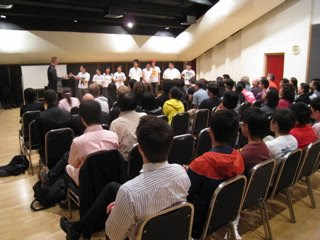 Matt responded to their questions on various issues particular to a cappella singing including tuning. We demonstrated a little about underlying accompaniment by singing some of "Walk in Jerusalem." 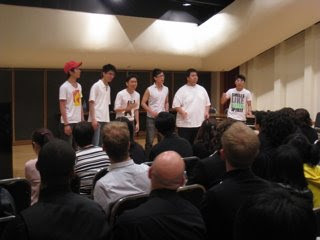 The next group were the Hot Potters who sang "When she loved me" and "Through the Eyes of Love". 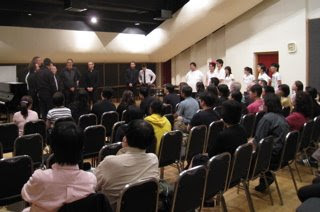 Among the other issues discussed were the announcement of pitch, the relative merits of tuning forks and pitch pipes, and how close to stand to one another. 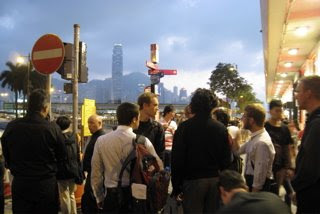 Out into the warm and glittering Hong Kong night, a number of us wearing new shirts we managed to purchase between arrival and the workshop. The hard thing, as everybody knows, is NOT to shop in Hong Kong. We're enjoying it so far!